Review C » Can Rouhani bring a change? When Hassan Rouhani was sworn in as Iran’s 7th President in August 2013, change in the country’s politics was anticipated. Rouhani as a moderate cleric promised to improve the economy and mend international relations. Many speculated that the future of Iran depended largely on Rouhani’s political cooperation with the West and particularly with the United States. Whereas mistrust and deception has escalated during Mahmoud Ahmadinejad’s presidency, at the moment American statesmen and lawmakers are willing to renew negotiations on hot-button issues. If history is of any indication about what will happen, overly optimistic views on cosier Iranian-American relations shouldn’t be too eagerly expected. The relationship between the two countries has been complicated for several decades and it is uncertain whether Rouhani would be able to change it. There is mistrust on both sides and a new Iranian president doesn’t necessarily forecast a fresh start. Whereas Iran might be willing to change its attitude and rhetoric, it does not plan on removing its nuclear program. The United States on the other hand, would not step off their aim to completely remove any nuclear power in Iran. All the eyes are now turned to Rouhani as the destiny of Iran depends on his actions during the next four year of his Presidency. From the start of his Presidency, Rouhani emphasized in his speeches that international cooperation and peace are what he aims to achieve in his first mandate. At the United Nations General Assembly in September of last year he declared that Iran’s nuclear program ‘must pursue exclusively peaceful purposes’ and that nuclear weapons contradict his country’s fundamental religious and ethical convictions. He didn’t speak only about his political goals but also about national interests. Rouhani made it clear that it is his goal to remove any concerns about Iran’s nuclear program. As much as Rouhani was trying to prove that Iran has no intention of developing nuclear weapons, he added that it is unrealistic to ‘presume that the peaceful nature of the nuclear program of Iran could be ensured through impeding the program via illegitimate pressures’. Rouhani showed he is willing to cooperate with the international community and to build mutual confidence with the aim to increase transparency. However he did not advocate for dismantling of the nuclear program. Rouhani’s approach towards his western counterparts triggered the first direct talk between Teheran and Washington. President Obama spoke with Rouhani by telephone which raised the possibility of ending the dispute and reaching an agreement over controversial issues. Obama afterwards stated that a ‘comprehensive solution’ could be reached. Rouhani’s moderate tone brought hope as he began to pave the way to recover relations between the West and Iran. Substantial improvement was also there at the P5+1 meeting in Geneva a month after the meeting at the United Nations. The talks were concluded on a promising note, and for the first time a joint statement was released. A clear shift between Iran’s former President Mahmoud Ahmadinejad and Rouhani was observed among the permanent UN Security Council members and Germany. Iran’s aim for the talks was to achieve recognition of its peaceful nuclear energy pursuit; however it stumbled upon some technical issues. A spokesman for the White House, Jay Carney, stated that ‘the history of mistrust is very deep’, but he concluded that the United States is approaching the matter with cautious optimism. According to international law, Iran is in fact allowed to have nuclear power which can be used as a source of energy. Iran signed and ratified the Non-Proliferation Treaty and is thus allowed to import uranium and plutonium which are used for nuclear reactors but also for the creation of nuclear weapons. Sanctions, which were imposed by the United States upon Iran, are illegal and perceived by Rouhani as warfare without military involvement. Iran was caught in a difficult situation. Civilians were suffering due to the shortage of basic goods and medicine and its President thus had to step up and ease international relations. With such a policy, the United States was escalating the tense relations with Iran and now Iran is responding with an olive branch. Whereas the world is wondering about how dangerous Iran’s nuclear program is, questions of legitimacy towards the United States actions are hardly raised. The threats which the United States and Israel raised against Iran are in fact incompatible with Chapter VII of the UN charter. Benjamin Netanyahu warned Iran saying “if sanctions don’t work, they have to know you’ll be prepared to take military action”. War rhetoric which was used by Israel and the United States went unpunished and the Security Council never reacted to it. The former US Senator Mike Gravel even called sanctions ‘illegal and improper’ since Iran is a peaceful nation and ‘there’s no reason to sanction Iran.’ On the other hand, Iranian politicians didn’t ease the situation with their statements either. Ali Khamenei for instance vowed to confront and defeat the ‘cancerous tumour’ of Israel. The results of Rouhani’s efforts to consolidate Iran-Western relations have already shown to be positive after the recent World Economic Forum meeting in Davos, Switzerland. Rouhani and Oil Minister Bijan Zanganeh met with the world’s most powerful oil executives to assure that Iran is open to Western investments and is eager to rebuild ties with the West. An interim deal was reached this month and United Nations inspectors already reported that Iran undertook the agreed steps and had already begun suspending uranium-fuel enrichment. Rouhani’s goal to ensure that sanctions will be lifted is being realized, as the United States approved of ‘limited, targeted and reversible sanctions relief for a six-month period.’ Nowadays Iran is finally on track to increase economic growth, loosen the sanctions and become internationally accepted as it was before the 1979 Revolution. Rouhani’s aim for this year’s fall is to attract new investment. He is targeting new oil contracts and hopes to increase the economic situation as well as the living standard in the country. It is difficult to predict whether Rouhani will be able to make significant changes regarding the nuclear policy. Despite the fact that he is a democratically elected president, he is not the most powerful political figure in the country. Circumscribed by conservatives, the clerics and most importantly the Supreme Leader, there is little influence Rouhani has over the executive branch of the country. He doesn’t have enough power to change the nuclear policy of Iran. Since the political system of Iran is fairly complex and closed off to Western influences, analytics are only able to speculate how powerful Rouhani’s word is in domestic politics. Regardless of national elections that enabled Rouhani to become a President, and being supported by a majority of the population, in practice he is not the most important official in the country. It is the Supreme Leader: Ali Khamenei. He is appointed by the Assembly of Experts and has the power to appoint the head of the judiciary, six members of the Guardian Council and commanders of the armed forces. He can also directly influence the public since he appoints the head of radio and television as well as Friday prayer leaders. Ali Khamenei is the most powerful individual in this autocratic regime, although he rules the country by consensus. The observations about him vary; he is described by some as a weak and indecisive ruler, while others describe him as a cleric who is manipulated by a small group of advisers. For Iranian youth and young adults he is a political fixture. During their lifetime he was either a President (between 1981 and 1989) or a Supreme Leader. He doesn’t inspire resentment nor is he praised by the people. Although he is the most important figure in the country, his profile outside of the country is overshadowed by the President. Whether this is done purposely or unintentionally is unclear to the West. 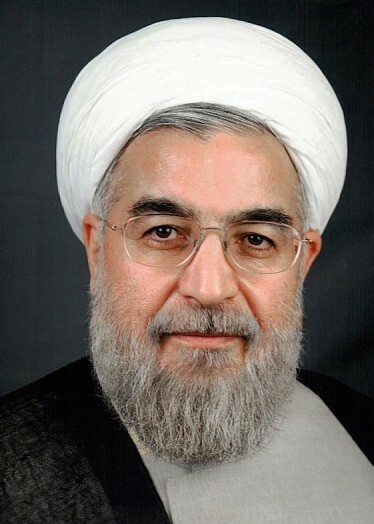 Both Rouhani and Ali Khamenei have declared in various speeches that Teheran doesn’t intend to produce nuclear weapons, but to use nuclear power and produce nuclear fuel. Ali Khamenei stressed that nuclear weapons are a threat to political power and security, and called the use of such weapons a sin. Iran even proposed a ‘Middle East free of nuclear weapons’ idea and emphasised on their commitment to it. He doesn’t abstain from producing nuclear power and nuclear fuel which, as he points out, is a right of every country based on international laws. In his speech in 2012 at the Non-Aligned Summit in Tehran, Ali Khamenei strikingly pointed out the paradox Iran is facing due to its interest in nuclear power. Whereas the United States possesses the largest amount of nuclear weapons and is ‘the only country guilty of its use’ it is currently trying to prevent nuclear proliferation and took on the role as the main opposing party. Khamenei even called out on the West, stating that it is blocking Iran’s nuclear achievements by pretext of fear of production. He concluded his rhetorically well written speech by adding ‘one who makes nuclear threats in the 21st century and does not feel ashamed, will he feel ashamed of lying?’ Ali Khamenei directly attacked the Western countries and labelled their actions hypocritical. His approach to the nuclear question was understandably negatively perceived by the West and the United States in particular. Whereas Rouhani is trying to mend the relations, Ali Khamenei isn’t as willing to cooperate. As a response to Rouhani’s achievements at the P5+1 meeting, Ali Khamenei stated in his speech in November 2013 that ‘no one should think that the negotiating team of our country have compromised with the other party which includes America.’ His suspicion that the United States is using nuclear power as an excuse is once again emphasized in the same speech and there seems to be a clash between Rouhani’s and Ali Khamenei’s interests. Whereas Rouhani has set its goal to improve diplomatic relations, Ali Khamenei is not following his objectives. Since the Islamic revolution, relations between Iran and the United States were tense. The fact that Khamenei holds the position of a Supreme Leader since 1989 is perceived as a threat to world security. He is often described by Western media as a paranoid, antagonistic leader. The relations concerning the Middle Eastern area are delicate and the United States are suspicious about Khamenei, seeing that he didn’t cave to their pressure and sanctions. In 2008 when Obama came to the White House, he renewed the US sanctions against Iran, despite the fact that he promised to form détente with Iran. Whether the question of the Iranian nuclear program will be resolved doesn’t depend solely on Iranian efforts but also on the American response and their willingness to compromise. As Kenneth M. Pollack a former CIA analyst stressed, one of the main problems is that the United States does not have enough information to define a clear policy towards Iran. The mistrust emanates from Teheran as well as Washington, nevertheless there still is a possibility for this complex relationship to renew and start the year 2014 on a different note. Even though the two countries have a seemingly different outlook, they have cooperated in the past and will certainly cooperate in the future. If Obama and Rouhani would work together on common points of interest, such as the Afghan opium fields or common the desire to secure Iraq, rapprochement would be possible in the future. The election of Rouhani demonstrated that Iranians are willing to engage with the West and thus want a leader who is receptive and aims to make peace. Iranians have made their step by a democratic process and it is anticipated from the United States whether they will react in a pragmatic manner, different from the one in the past.